Representative Tom Murt (R-Montgomery/Philadelphia County) is the prime sponsor of House Bill 22, which would amend the PA Constitution to create an independent redistricting commission for legislative redistricting (PA House and Senate districts). Representative Steve Samuelson (D-Northampton County) is the prime sponsor of House Bill 23, a statute that would amend the Pennsylvania election code to create an independent commission for congressional redistricting, with additional safeguards and constraints for both the congressional and legislative redistricting process. These bills were introduced with bi-partisan support with over 40 percent of PA Representatives already co-sponsoring. Under current Pennsylvania law, congressional redistricting is done by the General Assembly enacting a statute through the normal process that any bill would go through to become law. HB 23 would change that, creating an independent commission to handle congressional redistricting. Legislative redistricting is currently done by a five-member commission, controlled by the legislative leadership, through a process that is spelled out in the Pennsylvania Constitution. HB 22 would amend it to create an independent redistricting commission to handle state House and Senate districts. However, enacting a constitutional amendment requires that a bill be passed in consecutive two-year sessions followed by a voter referendum. That means the earliest voters could approve a new legislative redistricting commission would be at the May Primary Election in 2021, too late to begin the process of selecting and training a commission in time to have new maps in place for the 2022 election. 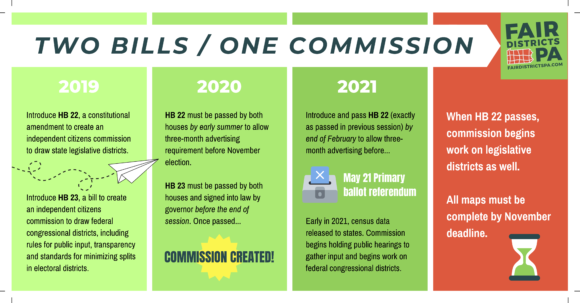 The two-bill package of HB 22 and HB 23 proposes to address this timing problem by having the General Assembly enact HB 23 during the 2019-20 session to create an independent commission for congressional districts. HB 22 would be passed in both the 2019-20 and early in the 2021-22 legislative sessions. By the time voters were able to approve it in a referendum in May 2021, the new congressional redistricting commission would already be in place and ready to take over the legislative redistricting process as well. The bills contain similar provisions relating to the makeup of an independent redistricting commission and its duties. Both bills also specify the same criteria for how congressional and legislative districts must be drawn. HB 23 incorporates more implementing detail, which is more appropriate in the election code than in a constitutional amendment. Both bills reflect the work done on bills in the past session, incorporating some key changes suggested by legislators and advocates over the past two years. The independent commission would consist of 11 voters selected at random by the Secretary of the Commonwealth from prescreened pools of qualified applicants: four Republicans, four Democrats and three not registered with either major political party. Both bills include eligibility criteria prohibiting certain types of individuals from being appointed. These include elected officials and their employees, political party operatives and lobbyists, among others. HB 23 contains additional restrictions on eligibility and on the activities of commission members for a period of time after their term expires. The bills would require the commission to conduct public hearings in different regions of the Commonwealth both before and after the publication of a preliminary redistricting plan. All meetings would be open to the public. Commissioners and their advisors would be prohibited from communicating with anyone else about redistricting matters except at a public meeting or when the communication is shared and entered into the public record. Approval of a final redistricting plan would require at least seven affirmative votes, including at least two votes from members of each political group. One significant change from past bills, prompted by feedback from legislators in both houses: if the commission fails to approve a final plan by November 1 of the year following the census, the commission would be required to consider various proposed plans through a process of elimination. If the elimination voting process also fails, the state Supreme Court would adopt a final redistricting plan. Previous election results, with limited exceptions. The bills also prohibit plans that purposefully favor or disfavor incumbents, candidates or political parties. Currently, the state Constitution requires that legislative districts be composed of compact and contiguous territory and prohibits division of counties, cities and other municipalities unless absolutely necessary. The bills would keep these restrictions and impose them on congressional districts as well. In addition, a county could not contain more senatorial districts than the number required by the population plus one, nor more representative districts than the number required by the population plus two. In the event that HB 22 is not approved by the General Assembly or the voters in time for the next round of redistricting, HB 23 would require that the existing five-member commission comply with several of the reforms detailed above, including redistricting criteria, transparency and public hearings. Senators Lisa Boscola and Mike Folmer have reintroduced Senate Bill 22, the “Folmer amendment” of the bill Fair Districts PA supported in 2017-18. Given the timeline for passage and the deadline requirements included in the bill, Fair Districts PA cannot support the bill as written, since a commission would not be in place in time for the 2021 redistricting. In addition, there are aspects of the bill that weaken the independence of the commission and deserve reconsideration. Fair Districts PA will be looking for ways to amend the bill in the Senate State Government Committee or in the House if voted from the Senate.